Tamarind trees produce small, bean-like fruit that are used in many different ethnic cuisines. They also have beautiful wood. 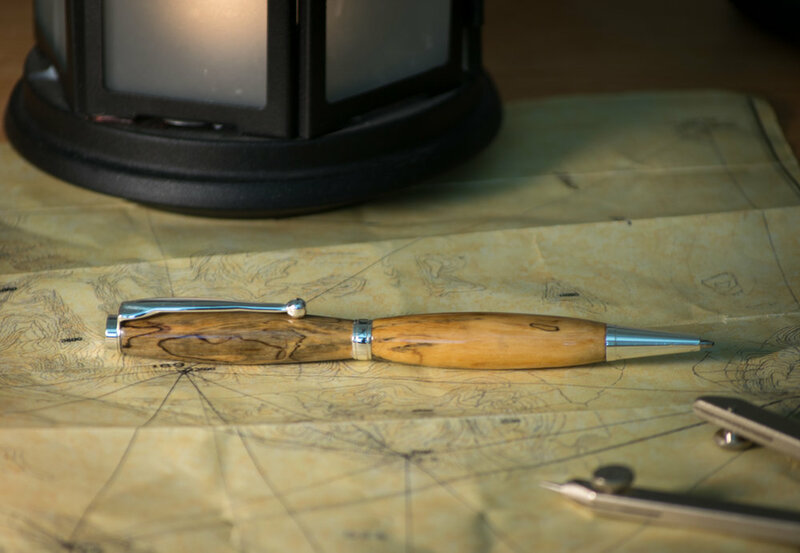 This pen is made from Tamarind wood that has been “spalted”, resulting in the dark streaks you see here. Spalting is a process where fungi discolor the wood, typically on already-fallen trees, and can lead to some really stunning patterns and color variations in the wood. While spalting can result in all sorts of unusual colors and patterns, this particular pen features dark streaks against the natural yellow-tan of the wood. This pen has been coated with a protective acrylic finish, to improve durability and to bring out the natural beauty of the wood. The shiny chrome-finish metal hardware of the pen compliment the glass-smooth finish on the acrylic coating. This is a twist-style pen, and uses “cross”-style ink refills, available at most office supply stores.